Caught With Nutella! This Little Girl Is Too Cute For Words! 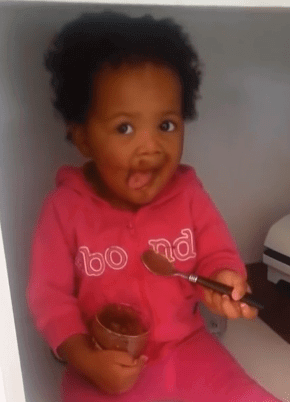 This little girl gets busted as her mom finds her eating Nutella in the pantry. Normally, kids who get caught look guilty and try to avoid being found out, but this little girl does the complete opposite. She continues to eat and savor the Nutella and even give mommy a cute face! How could mommy afford to get angry with this sweet girl! As soon as she realizes that she’s in trouble, she looks at mommy with a big smile! Now that’s cute! Previous article This Boy Hears His Mom’s Voice For The First Time And His Reaction Is Priceless! Next article How To Wrap Oddly Shaped Gifts- This Will Come In Handy! This Boy Hears His Mom’s Voice For The First Time And His Reaction Is Priceless! How To Wrap Oddly Shaped Gifts- This Will Come In Handy!